Troubleshoot Error 49 (download or update failed). Try the following steps in the recommended order. 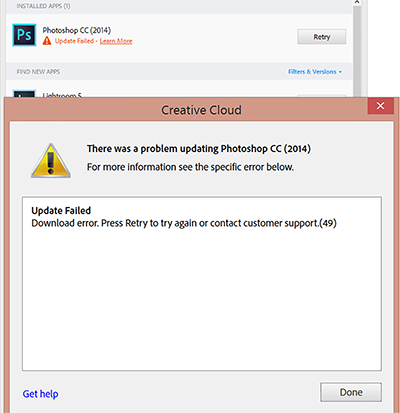 Try downloading or updating your Creative Cloud apps after each step to verify whether the issue is resolved. 2. Rename the 1.0 folder to 1.0_old. For example, navigate to the AAMUpdater folder on your computer and change the name of the folder 1.0 to 1.0_old. installation is complete. For more information, see Turn Windows Firewall on or off. Mac OS: i. Go to the Finder. ii. Choose Go > Go to Folder. iii. Type /tmp and click Go. Error 49 can occur when the installer is unable to access a critical file or directory during the installation process. It typically occurs when installed security software prevents the required access during the installation or update process.